S-1800 Super-Stamp® Gray and S-1801 Super-Stamp® White are single-component, cementitious products designed to create the look of natural stone, and any other desirable textures over existing concrete. 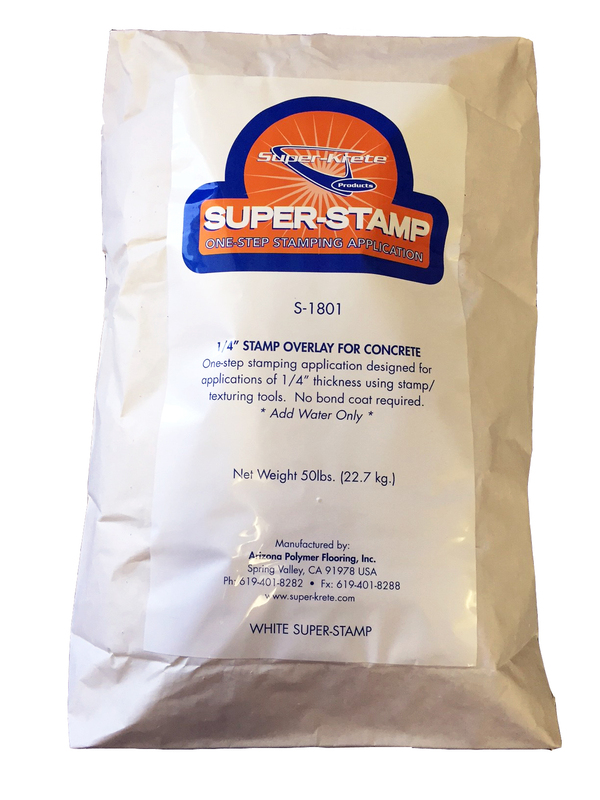 Super-Stamp is a ready-mixed proprietary blend of a specially modified water-resistant, acrylic co-polymer resin mixed with various sized aggregates formulated to maintain a 1/4" thick profile that can be stamped or textured using specially designed tools and templates. Super-Stamp eliminates the need to remove and replace concrete whether new or old while beautifying and increasing curb appeal. Super-Stamp is a revolutionary 1/4" overlay system, because other 1/4" overlay systems require a "wet-on-wet' application. Super-Stamp does not require the use of a bond coat or primer. S-9500 Color Stain™ can be applied over the finished stamped product to create a natural look that resembles true stone, or a custom colored appearance. Super-Stamp is available in White and Gray. For detailed Stamp Overlay application instruction, refer to the 1/4" Stamp Overlay System. This product is designed to be a part of a system and is not intended to be used alone.